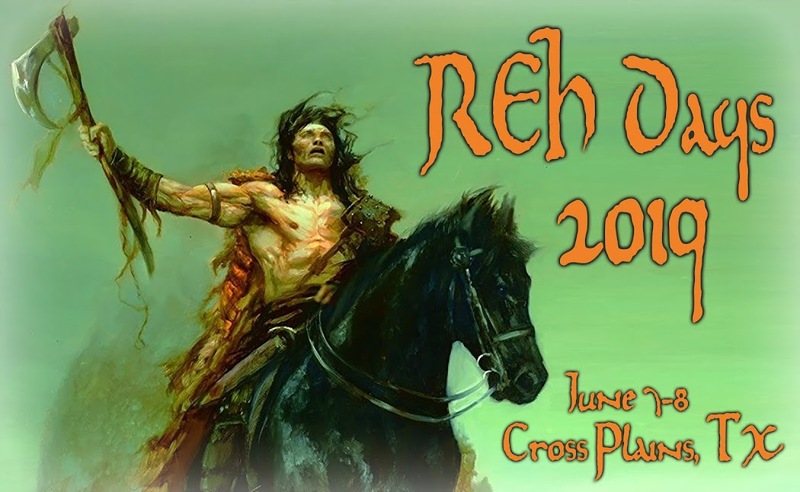 Robert E. Howard Days: One Month Until Howard Days! With June 10th being one month from today, it might be time to work on our Howard Days checklists. First on the list should be: Registration for Howard Days. Now, you don't have to register to attend the House Tours, Bus Tour, panels, activities or BBQ, but your $15.00 registration fee will get you a seat at the Friday night Banquet at the Community Center. As seating is limited to around 120, you want make sure there's some chicken fried steak with your name on it - plus you'll be on site to bid on all the great Howard collectibles in the Silent Auction there! If you're not already registered, don't wait until the last minute! Thanks! Secondly, this is a perfect time to support the aforementioned Silent Auction by making a donation of Howard items (books, magazines, fanzines, 2D and 3D art, comics, etc.) There's time for you to ship these items to: Project Pride Howard Days Auction, POB 534, Cross Plains, TX 76443. 100% of the proceeds from this auction goes to the upkeep of the House Museum by Project Pride. And while there's no planning for some extemporaneous events that always pop up at Howard Days, we can tell you about several of them. STOP THE PRESSES! (That's newspaper jargon for 'pay attention'...) While we know the Howard House is open on Thursday June 9th from 2-4 pm, let it be known the fine folks at The Cross Plains Review are also opening their doors at the same time for a tour for any early visitors to Howard Days. Their building is now a designated Historical Site and contains most of the same old-time newspaper printing equipment that was there when REH lived in Cross Plains. So pass through their threshold and step back to a time when newspapers were the #1 for of communication. The CP Review is looking forward to seeing you. There will be a Launch Party in the Pavilion for the brand new Howard pro-zine: SKELOS #1 - The Journal of Weird Fiction and Dark Fantasy. This beautiful new vehicle for fantasy stories and art (plus some never-before published REH) will no doubt set the Howard fans and collectors abuzz - and you'll be able to get first crack at it ONLY at Howard Days. Their Kickstarter is currently ongoing and they've got a Facebook page too, so check it out! We're going to have a second smaller Auction at the Pavilion on Saturday afternoon/evening (time TBA), but probably tied in with the BBQ) where we'll have y'all bid on items like the Howard Days banners and a few other special items. 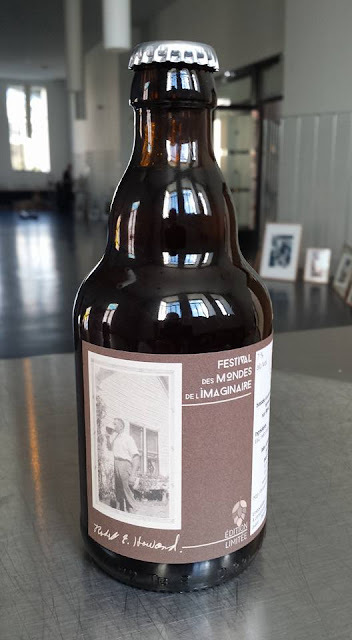 One of those items is rumored to be a limited edition bottle of Robert E. Howard beer - a special import brew compliments of Patrice Louinet. Again, 100% of the proceeds go to the Robert E. Howard Museum. And while not so extemporaneous this year, the REH Porchlight Poetry event will feature an encore presentation of the poem "Cimmeria" being read in SEVEN languages! Last year we just let it pop up at the Saturday night Porchlight Poetry and it was simply fantastic. Come hear one of Howard's most powerful and endearing poems read in English, French, German, Japanese, Italian, Spanish and Polish. It will be memorable. Also, be sure to check out Cross Plains' BARBARIAN FESTIVAL on Saturday from 10-4 in Treadway Park, 3 blocks west of the Howard House. It's a great time at a good ol' country fair with vendors, games, rides, activities and great food - family fun for all! No doubt there will be additional surprises and special guests who show up at Howard Days - there always are - and it's never too late to decide to come to Cross Plains for The Best Two Days in Howard Fandom. We certainly hope to see your smiling mug on June 10th & 11th - or even a day or two early.